Supporters of Republican presidential nominee Donald Trump are passing around early voting totals which purport to show Trump up big in Wisconsin, a swing state that that appeared to be solidly in the camp of Democratic nominee Hillary Clinton. But the early voting totals are clearly fake, though their exact origin is unclear. The results in question come from WisconsinVote.org, a joint operation of Wisconsin Public Radio and Wisconsin Public Television. The website is primarily a public service, offering information on candidates, races, issues, and how to register to vote. But the website also features a results page, which intriguingly currently shows Trump with a large lead over Clinton. While current polls show Trump trailing by about 7 points, the results page shows him destroying Clinton 40.2 percent to 29.7 percent. Libertarian candidate Gary Johnson has a hefty 19.8 percent while various other third parties are given the rest. 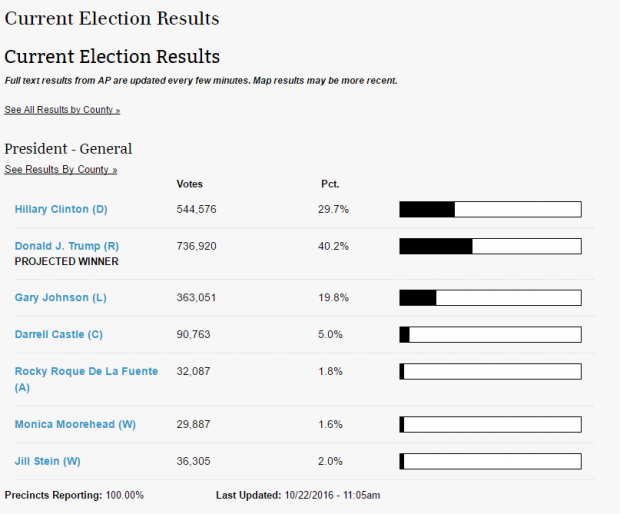 The results page shows supposed results in other races, including the U.S. Senate race (Russ Feingold is beating Ron Johnson) and Paul Ryan’s House race (he’s losing to challenger Ryan Solen). Unsurprisingly, the results are being passed around by Trump fans online, having popped up on Reddit and repeatedly on Twitter. But a close look reveals that the results are very obviously fake, and it’s not simply because the results are pro-Trump. First off, the basic idea of the results is fallacious. While Wisconsin allows people to vote early either in-person or absentee, early votes aren’t actually counted until election day. Even if the votes were being counted, the page lists far too many votes to reflect the current reality. According to the Wisconsin Elections Commission, only 223,000 early votes have even been collected. Further, while the presidential results look relatively “real” (albeit very unexpected), downballot races on the page do not. Almost every House or state legislative race shows the winner leading 55 percent to 45 percent exactly, a level of consistency that would never be seen in real life. The page also allows one to view results at the county level, and those also reveal the dubious nature of the votes. For instance, the results show Trump easily winning Dane County (which Obama won with 71 percent of the vote in 2012) but losing in Washington County (where Romney won 70 percent in 2012). 2016 has been an unconventional race, but a shift that dramatic is beyond the realm of possibility. While the results are clearly fake, it’s not clear why they’re present on what is otherwise a legitimate website. The results page isn’t accessible through other parts of the website (one must be directly linked), so it’s possible the page wasn’t meant to be accessed and is filled with false vote totals for the purpose of testing the page. It’s also possible that the page was hacked in some capacity. The Daily Caller News Foundation reached out to WisconsinVote but has not yet received a reply. Update: Andy Soth of Wisconsin Public Television replied to TheDCNF and explained that the results were simply random numbers not meant to be seen by the public.